Kris Ferguson had a lot to celebrate Saturday. It was her birthday, but that milestone came secondary to the party for one of her greatest labors of love. Ferguson is the Gordon cyclist who turned tragedy to triumph after being struck by a motor vehicle while riding along Nebraska Highway 27 south of the Sheridan County city. While recuperating from the 2011 accident, which required her to be flown to Scottsbluff for emergency care, she launched an effort to develop a section of the Cowboy Recreation and Nature Trail. Her goal was to have a place for area residents to bike and ride away from the danger of passing cars and trucks. Mission accomplished. More than 150 people gathered Saturday at the Rushville American Legion to celebrate the opening of the new 15-mile section of trail between Gordon and Rushville which opened earlier this year. The project is the result of a cooperative effort between many volunteers, donors and the Nebraska Game and Parks Commission. 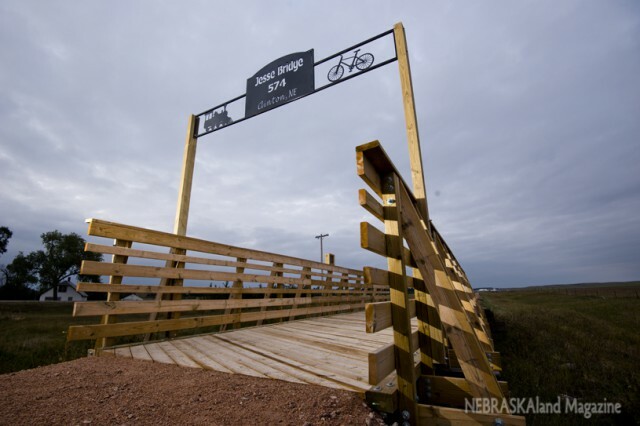 The work began in 2013, and has been completed primarily by a non-profit organization formed for the task — Cowboy Trails West, Inc.
With materials provided by the Commission, volunteers worked to improve three bridges and construct nine benches along the route. Three miles of the trail have been finished with crushed limestone, purchased by salvaging the rocky ballast, which supported the rails and wooden ties along the route. Areas that haven’t been finished with limestone have been packed to smooth the surface. The ceremony also included a presentation of plaques that will be displayed along the route, and the long list of names on them. Among those receiving special recognition during the event was Ross Elwood, owner of Frontier Service and Supply. Ferguson said getting Elwood on board was the most important part of the journey, as he has volunteered an incredible amount of time to the effort. Elwood passed much of the credit on to others, the most important of which he said was Kent Forney, a Rushville native who serves as chairman of the Game and Parks Board of Commissioners. Also among the speakers was Roy Retzlaff, who delivered heartfelt words about the bridge near Clinton. That structure is dedicated to his late grandson, who was killed in a 2012 automobile accident. Jim Douglas, director of the Game and Parks Commission, said he has watched the development of the Cowboy Trail since its beginning in 1992 when the rail line was abandoned and sold the Rails to Trails Conservancy. It was later transferred to the Commission, and 195 miles between Norfolk and Valentine was completed and now gets used by more than 20,000 visitors each year. Douglas likened the entire Cowboy Trail project to reading a story, and said he especially likes the latest chapter. While the trail is open for use, the organizers are working to get more crushed limestone added to the surface. And Douglas hopes there or more chapters to the story coming for additional sections of the trail. Douglas announced during the event that the Commission is developing a plan to complete the entire 321-mile trail, which is the longest rails-to-trails conversion in the nation. He also announced the Commission recently received a grant to plant monarch butterfly habitat along the Cowboy Trail. With such news, and the spirit of communities along the route, it appears much of the Cowboy Trail story remains to be written and there are celebrations yet to come.